By Don Hammonds That sleek looking blur that just roared past you just might be a 2018 Infiniti Q50 Red Sport 400. Infiniti is not playing with this car--they are deadly serious about making a name and building a rep for this particular model. Of course, the big elephant in the room in the superfast midsized luxury sedan market are from BMW in the form of its M sedans. But never mind. The Infiniti has a couple of cards to play that I think one-up the fabled M series. 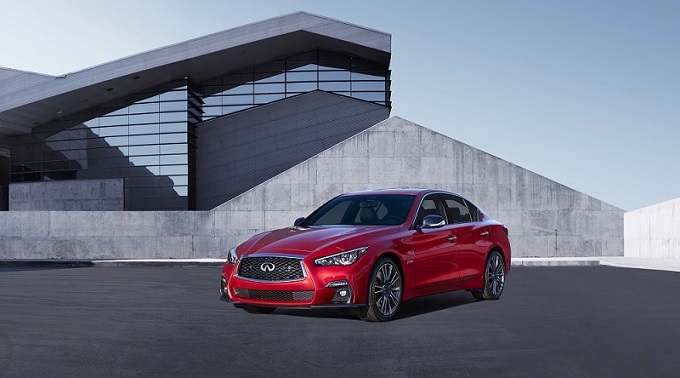 Infiniti's Q50 Red Sport is also strong on creature comfort and interior sedan. BMW's M models are well appointed, but the Teutonic flavoring can be a bit wearing and somewhat austere. Our Red Sport priced out at $61,710, and it is powered by a mighty 400 horsepower, 3.0 liter, V-6 twin turbo engine that produces 350 lb/ft of torque. As for fuel economy, this car is rated at 21 miles per gallon overall, 19 city and 26 highway. But we were able to get a couple extra miles per gallon out of it and we were not always backing off the accelerator pedal, so take that for what it is worth! The Feds say you will spend $2,750 more in fuel costs over five years compared with the average new vehicle, and it takes 4.5 gallons to drive 100 miles in this car. Annual fuel cost is $1,900 based on $15,000 miles driven annually with gasoline costing $2.80 per gallon. By nature, Infinitis have always appealed to a special audience. Think of them as a kind of boutique flavored lineup of vehicles. They usually have an extra dose of interior luxury that look as though they are hand sewn with a kind of English bespoke flair to them. They certainly are powerful--pulling away from the crowd is never a problem. And they have distinctive, resolutely Japanese exteriors. And one more thing: That exhaust note! Like nothing else on the market and you will hear it from quite a distance away. The Red Sport builds on that with extra performance features, limited production desirability and a certain air of brutish elegance. When you get a Red Sport, you get a thunderous 400 horsepower V6 with 19 inch wheels that include rims that are wider in the rear. Other standard features are adjustable suspension settings, transmission paddle shifters, quilted leather upholstery, dark chrome and red stitching interior accents, heated front seats, a heated steering wheel, remote engine start, a 60/40-split folding rear seat and a navigation system. The Red Sport 400 also offers a host of driver aids, including a top-down parking camera system, front and rear parking sensors, blind-spot monitoring, rear cross-traffic alert, forward collision warning and automatic emergency braking. Inside, the seats in the Red Sport 500 have buttery soft leather, and they hold you gently, but firmly in place as you are driving. The car is chock full of features, so you need some time to get used to all that it offers. The only fly in the ointment is the split touchscreens, which take some getting used to and unfortunately, many of the controls are accessed through this rather complicated While the Q50 Red Sport is the crème de la creme of the Q50 lineup, we're certain that some of you swallowed hard when you saw that price tag: $61,000 plus some! But have no fear. Though some of the other models may not be quite as fast or responsive as the Red Sport, they are a joy to drive and a terrific entry level sport sedan lineup in any case. With that in mind, let's start out with the Q50 2.0t. With this one, you will get a turbocharged 2.0-liter four-cylinder engine (208 horsepower, 258 pound-feet of torque) paired to a seven-speed automatic transmission and rear-wheel drive. All-wheel drive is optional. Next up is the 2.0 Pure. Unusual name, admittedly, but equally lovely as the other models. You will get 17-inch alloy wheels, LED headlights and foglights, automatic wipers, selectable drive modes, keyless entry and ignition, power-adjustable front seats, simulated leather upholstery, automatic dual-zone climate control, Bluetooth, a rearview camera, dual touchscreen displays (8-inch upper and 7-inch lower), and a six-speaker CD player with two USB ports and satellite radio. The 2.0t Luxe variant adds 18-inch wheels, a sunroof and maple wood interior accents. Want to move a little more briskly? Take a look at a 3.0t. It has a turbocharged 3.0-liter, 300 horsepower, and you can, if you wish order all wheel drive version. Buying the 3.0 Sport gets you 19-inch wheels, performance tires, leather upholstery and additional front seat adjustments. The Sport and Red Sport 400 models and also include standard adaptive cruise control and a premium Bose audio system. As you would expect, the Red Sport 400 has plenty of safety features too. Along with the usual air bags, you get antilock brake assist, electronic brake force distribution, vehicle dynamic control that also includes a traction control system, a vehicle security system, blind spot warning system, rear cross traffic alert, backup collision intervention system, and Forward Emergency Braking. As for styling, well, judge for yourself. It's suave, understated, and handsome, but not likely to draw a lot of attention on the road. But that adds to the fun when you blow right by someone on the road! While the car has aged nicely through the years, we do expect an all-new series of Q50 models in a year or two, especially given that Infiniti has been staging some pretty good looking coupe flavored show cars recently that are supposed to give some hint as to the company's future styling themes. So....stayed tune. Yu are also well protected with the Q50 when it comes to the warranty. Infiniti provides a 4 year/60,000 mile basic limited warranty along with a six year, 70,000 mile warranty on the powertrain.